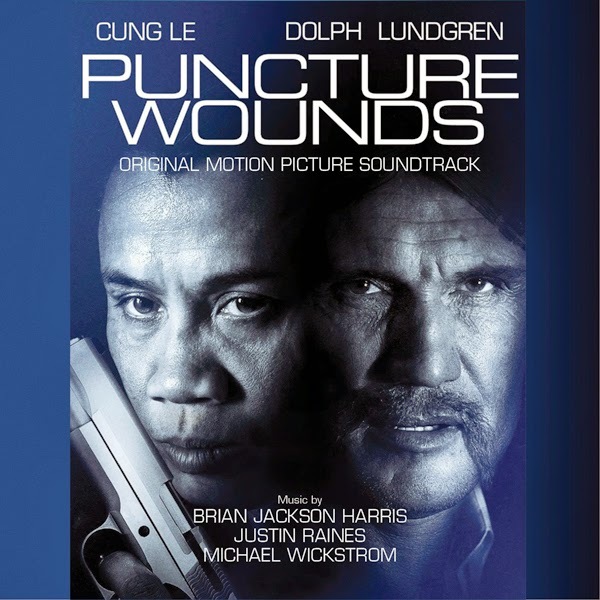 MovieScore Media releases the rocking, heavy metal-inspired soundtrack album for Puncture Wounds, an intense action drama about racial discrimination starring Cung Le, Dolph Lundgren and Vinnie Jones. Helmed by Belgian filmmaker Giorgio Serafini, the film is about PTSD-suffering Iraq veteran John Nguyen who finds his extensive military and martial arts training incredibly useful when he saves a call girl from members of the Aryan Brotherhood. The ruthless group takes it upon itself to avenge John’s intervention which had resulted in the death of several key members of the organization… Also known as A Certain Justice in several overseas markets, Puncture Wounds spans a powerful, eclectic soundtrack with an awesome, headbanging score in its musical center. Over the last couple of years, the composer trio of Brian Jackson Harris, Justin Raines and Michael Wickstrom have proven themselves to be a versatile group who can provide exciting action cues in several different styles and genres. Their music for Giorgio Serafini’s Ambushed (which also starred Dolph Lundgren and Vinnie Jones) was a welcome surprise to fans of retro-flavored action scoring harkening back to the sound of the 1980s. Their music for Puncture Wounds has more contemporary influences, including powerful heavy metal riffs and guitar solos, but also a folksier country atmosphere for moments of reflection. Produced by composers Brian Jackson Harris and Michael Wickstrom, the album offers a rich selection of music composed by the trio in addition to contributions from other artists to the soundtrack. The full list of composers and artists include Shay Mehrdad, Jeffrey Hayat, Steel Vengeance, Jay Woodcock, Darius Lux, Julian Angel, Electroillusion, Stephan Lindsjo and Benoit Martin. The music by these guest artists alternates with the score cues by Harris, Ranes and Wickstrom, yet the two halves form such a strong union that you’d be hard-pressed to guess where the songs end and the score begins.